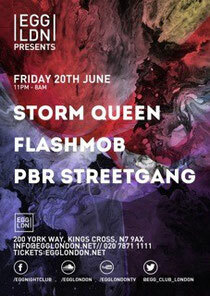 On 20 June, Egg London welcomes possibly some of the biggest dance music sensations of recent times with a headline set from Storm Queen, PBR Streetgang and Flashmob. Morgan Geist and Damon C. Scottare are Storm Queen, the house outfit with disco stylings and lovely vocals from Scott that recently scored a UK number one with their classic hit ‘Look Right Through’. They are also known for hits like ‘Let’s Make Mistakes’ and ‘It Goes On’ and every one comes on the Environ label that was also home to Geists’ Metro Area project. Their sound is full of infectious analogue grooves, fluttery vintage synth flutters and bold, emotive house vocals. In the early days, PBR Streetgang sharpened their claws warming up at English party Asylum in Leeds, before acts like Theo Parrish and Prins Thomas took to the booth. Now the duo are headliners in their own right, spinning everywhere from Garden Festival in Croatia to Eastern Electrics in London and plenty of places all over Ibiza. Known as Tom Thorpe and Bonar Bradbury, the duo has a vast arsenal of disco, house and techno in their reserves when DJing, but so too when producing. 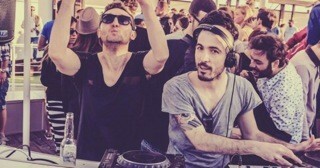 Becoming increasingly prominent in recent years, their productions have come on labels like Hot Creations, 2020Vision and Bristol’s Futureboogie. Flashmob is arguably one of the most acclaimed, instantly recognisable production groups in house music. Riding a tidal wave of success generated by the response to singles ‘Brick House’, ‘Ninety Five’ and – most significantly – ‘Need In Me’ (which has now passed three million views on YouTube), Flashmob have carved a niche for themselves crafting unpretentious house music. 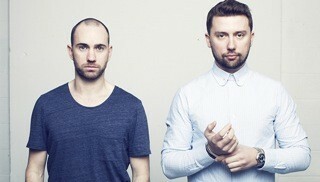 For ticket info, check: www.egglondon.net, in the meantime, download two top mixes from PBR Streetgang and Flashmob.